Full Circle is a collection of clarinet music performed by Seunghee Lee accompanied on piano by Katrine Gislinge. According to the liner notes, the collection represents the musical journey Lee has followed over the course of her recording career. She has a singing quality that suits the lyricism of all of the works, not one of which will give your ear any difficult sounds to sort through. Her earlier releases are colourful renderings of “classical” reworkings, segments of symphonies, opera arias, art song, etc. She is a player with indisputable technical strength and expressive tone, who on recordings stays away from more “difficult” repertoire. This is fine; she plays this material with grace and lovely conviction. 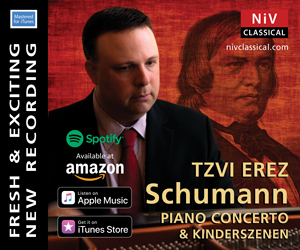 Included are two of the more substantial works of the Romantic era: the Fantasiestücke of Robert Schumann (Op.73) and Fantasy Pieces Op.48 of Niels Gade. Lee demonstrates the depth of expression needed to bring both to life, and if you’ve never heard the Gade, this is a great introduction. Bent Sørenson provides a somewhat syrupy confection in his Romance, premiered herein; Lucas Foss’ Three American Pieces for violin and piano, transcribed for clarinet by Richard Stoltzman and edited by Lee under the composer’s supervision, lend a somewhat more bracing counterpoint to the easy-listening character of most of the tracks. Music from a British television series, an Italian film-scoring composer, a little-known Vocalise (1935) by Olivier Messiaen and the well-worn Pièce en Forme de Habanera by Maurice Ravel round out this quirky collection.